The sofa is usually the centrepiece of any well-arranged living or lounge room. As such, the sofa set sees a fair bit of daily use (and abuse sometimes), traces of everyday living like stains, blemishes, soiling etc. are common issue for most sofas. 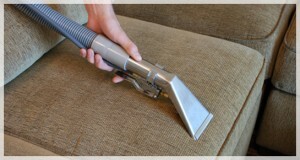 These however can easily be taken care of by our professional sofa cleaning in Liverpool. We will have your sofa fresh and clean, without any risk of damage or alteration to finish materials, colours or comfort properties. And yes, all the pennies down the back of the sofa will finally make their way to the penny bowl. Our Liverpool sofa cleaning service is safe and effective on basically all types of non-leather finish sofas, either natural or synthetic. The cleaning process will not alter or affect any visual or comfort properties of the sofa. The products and equipment we apply are also very effective in lifting and removal of stains off various fabrics and material finishes. Please be advised that if you need to remove a fresh stain, we strongly urge not to use homemade treatments but to us call instead. Homemade stain removal solutions can make the stain permanent or even damage the sofa material finish, so save yourself the trouble and let us deal with it. All sofa cleaning in Liverpool takes place onsite, making the service quick, efficient and hassle-free. The cleaning equipment we use is professional grade and allows for effective cleaning and sanitising on all sides of the sofa, its cushions, arm and head rests etc. We aim to minimise the use of solvents but when dealing with stubborn stains which need pre-treating we will apply sparing amounts of mild cleaning products. For specialised leather sofa cleaning, please refer to our leather sofa cleaning option or contact our consultants for more information. After cleaning is completed, the sofa will be damp since we use steam which condensates to water, the sofa should be dry enough to use in a couple of hours, however this will depend on relative humidity and ambient temperature inside the room. Using our sofa cleaning service will not shorten the lifespan of the sofa or any of its material finishes, even when applied on a regular term basis, over long periods of time. In order to yield the best possible cleaning results and cancel out the margin for error, we train our technicians extensively in safe and efficient sofa cleaning methods. The cleaners use professional grade steam cleaning machines which deliver exceptional results in minimum time, without risk of damage or alteration to the sofa itself. The sofa cleaning Liverpool service is available as standalone or as part of a service package. Either way, customers will receive proper results and adequate pricing. Sofa cleaning services are booked for all days of the week, under convenient hours. Our cleaning technicians will provide you with friendly advice on how to keep your sofa looking and feeling better for longer as well as any other upholstery that needs cleaning.